It snowed twice: beautiful big snowflakes this morning as our family was assembling to open gifts, and then driving home tonight from Christmas dinner with friends. It melted in between but it was a beautiful Christmas morning and evening. Something about snow is pure and new and touches me. We had a crazy 5.5 earthquake wake us up this morning. It is about the fourth one in the past ten days, which is unnerving. Our friend Beth said that in light of the recent activity, she has updated her earthquake survival kit recently…. We were blessed with some amazing gifts. Our kids had a really really fun day opening gifts and building/learning/trying on/imagining. So so fun. So so blessed. In the midst of it all, I got mad once at one of our kids, and had to apologize. We made up. I talked with my dad this morning. All of our kids did. It was his evening, which seems to be his hardest time in terms of being lucid. He wasn’t making much sense to any of us, and then suddenly to me he said, “Hey, I read your latest four- page newsletter that came. It’s exciting all the lives that are being changed!” And my old Dad was back for a short bit, quick to rejoice over news of God at work. The dementia has not managed to take over everything! I did a lot of cooking in between gifts and prep for Christmas day – made our traditional sausage breakfast casserole for brunch, and pot roast and chocolate chip cheesecake for dinner/dessert. They all turned out pretty good, though the pot roast was a bit dry. (It was still an awesome treat that we can’t usually get here!). Oh – and our favorite homemade eggnog for dessert time. I love it that our kids love it as much as I do! My highlight of the day was between 2 and 3. 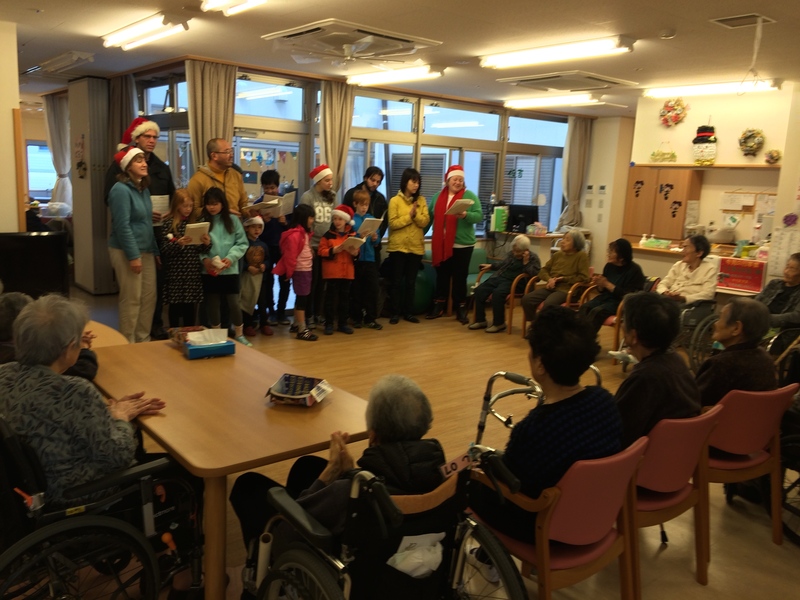 Our team all went to a local nursing home and sang Christmas songs and a few of our favorite worship songs. We had prepped our kids, knowing it wasn’t easy for them to do this. But I loved hearing their voices sing louder than the adults! We sang “Kimi wa aisareru tame umareta” to them – “You were born to be loved.” While we sang, we went out and greeted and shook hands with each of the attendees. I got to one sweet woman, and there were just tears streaming down her face. She couldn’t stop. She hugged me and kept squeezing my hand. Of course I couldn’t sing! Jennifer came over, still singing, and then her voice broke. Eric said that Ian (5) bravely went from person to person, shaking their hands. They were all waiting for this little dressed-up Santa to come and greet them too. I was proud of him and each of our kids. When we had finished our short time of singing and were saying goodbye, I went and sat with Mrs. Akio a bit longer. She said a lot has happened in her life. I looked at her eyes and could only imagine. I prayed for her and promised to come back. It was a wonderful treat to have our friend Y. go with us. From the minute we started singing, the tears started flowing for her. She was touched deeply today. I think we all were moved from our own self-preoccupation to focusing on these dear older ones who did not have the blessings that we currently have. There was an emptying of ourselves that happened; I sensed we all, like me, walked out a little lighter; with a little less of me. It’s the Christmas story, isn’t it? One who left his comfort for much for than an hour and emptied himself in a myriad more ways than we did. But it is such an immense privilege to join him in the emptying process of loving. It has been a wonderfully full day. Merry Christmas!